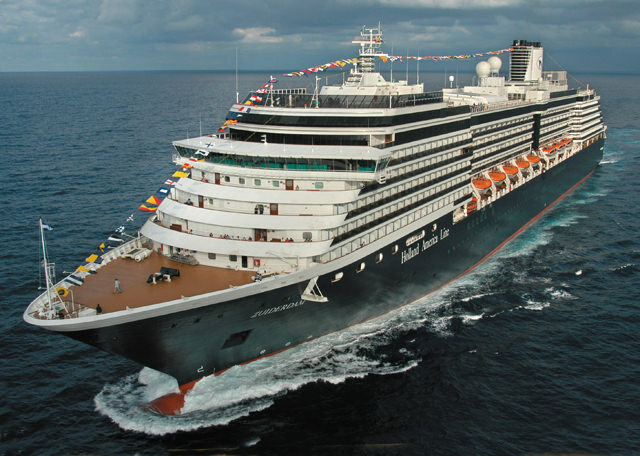 Holland America’s Zuiderdam ushered in a new generation of “dam-ships.” Photo courtesy of Holland America Line. Founded more than a century ago in the Netherlands, Holland America (HAL) continues to work its Dutch heritage into the design of its ships and into the elegant but affordable cruise experience it offers. The Holland America Line cruise ships are named for classic vessels in the line’s history (Rotterdam, for example, is the sixth HAL ship to bear that name). Large paintings of old HAL ships hang in the stairways, and floral themes, ship memorabilia, antiques and Indonesia touches (the Asian country being a former Dutch colony) all provide a subtle link to the line’s heritage. 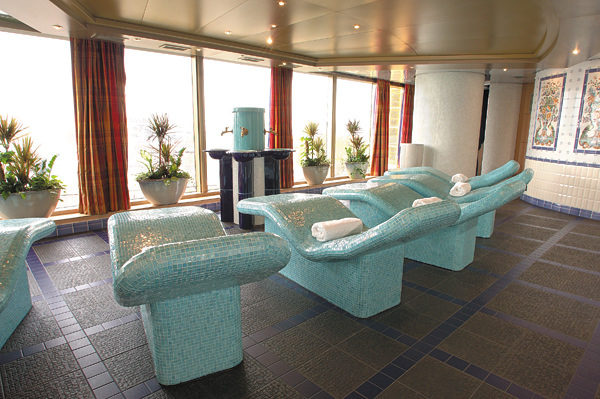 The Thermal Suite in the Greenhouse Spa features heated ceramic loungers and expansive ocean views. Photo courtesy of Holland America Line. At the same time, HAL very much rolls with the times, and you’ll find ships feature trendy Internet cafes, fun piano and sports bars, demonstration kitchens for cooking classes, roomy cabins with all the latest amenities, and cool new poolside pizzerias called Slice. Overall, the décor of the line’s newer ships is bolder and more colorful than the older ones. Traditionally HAL has attracted an older clientele, but in the past decade has succeeded in appealing to a broader demographic, including families on its summer and holiday cruises especially. There are cheerful playrooms, video arcades and teen rooms, plus most ships also have a secluded outdoor teen area called the Oasis. 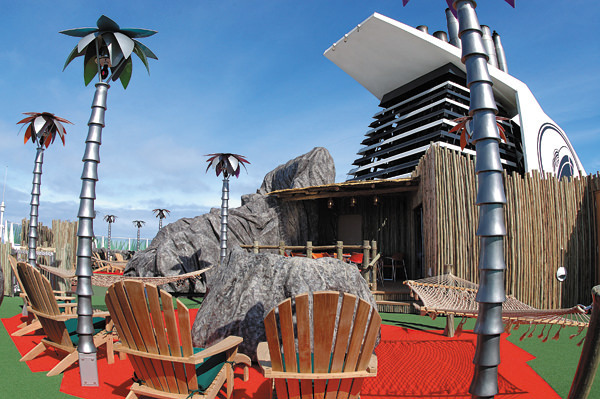 Located on Deck 13 aft of the funnel, The Oasis is a strictly “Kids Only!” haven. Photo courtesy of Holland America Line. When there are 25 to 30 plus kids aboard, supervised activities are programmed for at least three age groups between 3 and 17; at other times of the year, there’s always at least one counselor on board every sailing. While there are plenty of quiet nooks and crannies to hide with a good book or a deck of card, for active adults, HAL’s activities range from ballroom dance lessons to bingo, bridge, wine tasting, trivia contests, free computer workshops and self-guided iPod tours of the ship’s art collection. There are also well-stocked libraries with gorgeous inlaid marble tables. Goofy team games poolside or in a lounge cater to the young (and silly) at heart and always attract a big crowd. Evenings, each ship puts on small-scale Vegas-style shows, plus feature soloists, trios, and quartets that play jazz, pop, and light-classical standards around the ship. There are also movies shown in the onboard cinema and on a few ships, large LED screens on up on deck (part of a new concept at the ships’ stern called the Retreat, which also includes a new pool bar and pizzeria), plus crew and passenger talent shows that are always a hit. 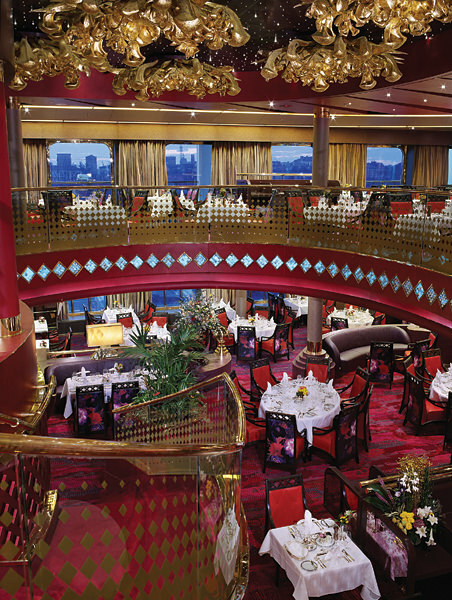 Meals are a true event when taken in the spectacular, two-story Vista Dining Room aboard Oosterdam. Photo courtesy of Holland America Line. When it comes to dining, restaurants are windowed and elegant throwbacks to bygone age of cruising, and the cuisine is generally tasty and varied. The line’s As You Wish dining program means you can opt for either traditional early — or late-seating dining at an assigned table or instead make a reservation and show up whenever you like. All the ships’ have an intimate Pinnacle Grill alternative restaurant focused mostly on steaks, chops, and fish (there is a $29 per person cover charge at dinner, $10 at lunch) as well as the Italian Canaletto venue at no extra cost. 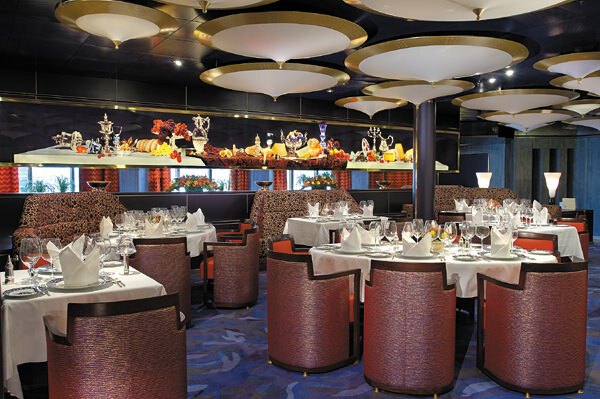 Treat yourself to a special dining experience at the Pinnacle Grill aboard the Westerdam. Photo courtesy of Holland America Line. The line’s newest ships also have the Pan-Asian Tamarind ($20 at dinner; no charge for dim sum at lunch). The Lido buffet restaurants offer pizza, grilled burgers, soft ice-cream and a taco bar stocked with all the fixins. HAL is well known for its daily afternoon high tea elegantly presented and served by white-gloved waiters, and you can enjoy free hot canapés in some of the bars/lounges during cocktail hour. Service is high point from the attentive and genteel mostly Indonesian and Filipino crew. Holland America ships’ cruise the world, with an especially strong presence in Alaska, Europe, the Caribbean and Panama Canal. Destination Collectors. Holland America Line’s expansive fleet sails to more than 320 ports on the nearly 500 cruises offered annually from 27 homeports. Itineraries range from two days to 108 days and visit all seven continents. Premium ship lovers. Holland America’s ships are mid-sized, carrying from 793 to 2,104 passengers, and featuring wraparound teak decks and staterooms that are on average 25 percent larger than other ships in its class. World cruisers. 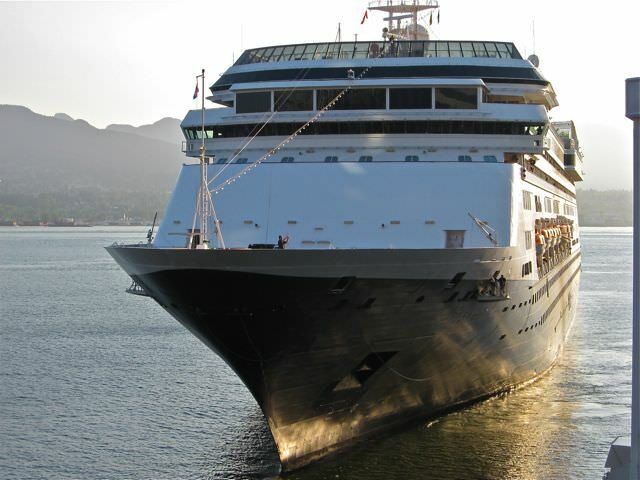 Holland America Line has operated world cruises for more than 25 years. Long cruisers. Holland America Line’s Grand Voyages allow passengers to explore a specific region of the world on an extended Holland cruise. Combine Grand Voyages to circumnavigate the globe. All meals, except for dining in the optional reservations-only restaurant Pinnacle Grill (US$25 per guest) and Tamarind (US$15 for dinner). Round-the-clock room service is complimentary. Fitness Center, except for instructor-led classes such as Spin, Yoga and Pilates. Entertainment, including Broadway-style shows and cinema. The New York Times online edition at internet stations in Explorations Café. Youth Programs, catering to kids, including Club HAL Kids for kids 3-7; Club HAL Tweens for kids 8-12; and The Loft and The Oasis, for teens 13-17. Only the smaller Prinsendam varies, with programs for kids ages 5-17. New Ships for Holland America Line, Princess Cruises: What Do We Know?